When it comes right down to it, there are really only a few types of window coverings — there are blinds, shutters, drapery, and shades. But the choices available within those types are almost endless. Here are some of the more popular eco-friendly window treatment for those who want to adorn their home in a style that suits their décor in an environmentally conscious way. Bamboo is a fast-growing woody perennial evergreen plant. Bamboo is such a readily renewable resource that there are even some gardening sites that will give you advice on how to curb its growth and spread! Although it is, strictly speaking, part of the grass family of plants many of the larger bamboos are tree-like in appearance with jointed stems and are sometimes referred to as “bamboo trees”. There are a number of advantages to natural fiber shades such as bamboo. They’re versatile as to style, available in roller shades and Roman shades for either inside or outside mounting and there are even options for patio doors. Some are available in top down/bottom up systems that allow light and air to flow in at the top while maintaining privacy at the bottom of the window. Because the shades are woven, light will filter in through the gaps between the fibers. The down side of this is that after dark, a lighted room will be highly visible from outside. So bamboo shades are probably not suitable for a bedroom or bathroom without a privacy backing. The wide variety of colors makes it easy to match or complement wood flooring, tiles and rugs. And they come in a wide price range that will accommodate most budgets. Solar shades have traditionally been used in commercial settings such as offices and restaurants. But they’ve been making their way into homes over the last number of years. Solar shades are generally made of a woven vinyl-coated fiberglass yarn that blocks UV light coming into a space. They are rated according to how much of the UV they let through and this rating is referred to as the amount of “open”. A 10% open fabric, for instance, lets in 10% of the light and blocks the remaining 90%. The range of open is commonly 0% to 14%. Solar shades will cut glare and heat from the sun, and while they do little to insulate a window, they will save you money on your air conditioning costs. Additionally, reducing the amount of UV light coming into your rooms will help to protect furniture and other fabrics and finishes susceptible to fading caused by sunlight. Solar shades are available in either dark or light colors, and color choice is generally a combination of function and aesthetics. A darker color with a 0-5% open is more effective at reducing glare while a darker color with a 5% or higher open will give you better view through the window. If you want to brighten a room, use a lighter color fabric with 5% open or more. To protect your UV-susceptible furniture and finishes, choose a 5% open or less in any color. 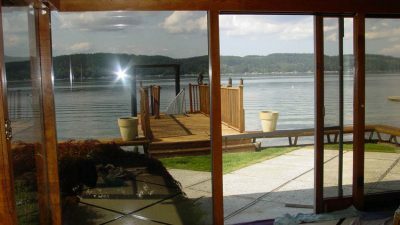 Solar shades are generally “see-through” which is a big plus for those with spectacular views but they do not provide privacy at night. Window films have come a long way from the old peel-n-stick technology of the 1960’s. Those of us of a certain age will remember carefully cutting the desired size and shape from a roll and peeling off the backing while trying desperately not to let the exposed corners flop back and stick to themselves. Today’s window films are much easier to install, much more forgiving of placement errors. Modern window films are available in a wide variety of designs that can provide energy savings, glare reduction, fade protection, and some safety from window breakage. Solar window films are made from PET (polyethylene terephthalate), a synthetic material that provides strength and optical clarity. UV blockers are added as well as either dyes or metals. Dyes will absorb heat and metals will not, so metals are used for residential and commercial applications. Solar films will block up to 80% of the sun’s heat, saving you money on summer air conditioning energy costs and providing you with fade protection from fabrics and finishes that are UV sensitive. They are transparent so your view is not blocked. The film also provides some measure of security if your window gets broken as it will hold the shards in place. They will not, however, provide privacy at night. As with everything else, some films are better than others and many pro installers will advise you to look for NFRC (National Fenestration Rating Council) certification. Shutters, while generally one of the more expensive window treatments, are a popular choice for energy savings, durability, ease of cleaning, light control and aesthetics. Shutters can be positioned to allow light and ventilation while maintaining privacy (you can see out, but nobody can see in). The louvers can be positioned such as to protect your fabrics and finishes from the sun’s harmful rays and shutters are easy to clean, requiring only a periodic wipe with a damp cloth. The most commonly used styles are Plantation and California shutters. The difference between the two is the width of the louvers. Plantation shutters have 3-1/2” louvers and California shutters have the smaller 2-1/2” louvers. There are also shutters available with 4-1/2” louvers. The wider louvers provide a better view when the louvers are open but Plantation shutters look best in large windows while California shutters are a good choice for either small or large windows. Shutters are available in vinyl, in wood, or in composite, each of which has its own pros and cons. Vinyl shutters are generally made of PVC (polyvinyl chloride) which makes them highly resistant to moisture. They won’t warp or flake, and are flame retardant. You are limited as to color choice with vinyl shutters; most are white or off-white with a small selection of other neutral colors. They cannot be painted or stained. Wood shutters are available in an almost unlimited variety of colors. Wood shutters can be painted but the aesthetic of a stained natural grain appeals to many people. Wood is the more expensive choice and they are susceptible to moisture. Composite is MDF wrapped in a PVC or vinyl coating is also referred to as “engineered wood” or “faux wood”. They are generally less expensive than wood shutters and are highly resistant to moisture. They are heavier than wood shutters and the color choices are limited. 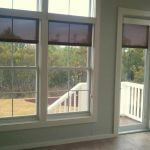 Call Sunshine Sunrooms for your dream sunroom and all of your remodeling and renovation needs. And enjoy the view! Call us today at (972) 243-5390.